se babies a cute makeover I realized they also needed to be more functional. Basically I just wanted a way to hold my cell phone while I was tottering around the house because what kept happening (over and over again) was that the mister would run out to do errands and would call to make sure I was doing ok while he was out. But since my knee was swollen and hurting I'd be wearing yoga pants or pajama pants (both of which have no pockets) and would miss the calls. By the time I'd get back to the phone he'd be starting to worry and I had twice as much unessesary crutching around. Long story short- I needed a crutch pocket! I don't know why I only feel like sewing while I'm sick or injured but it's definitely a theme with me. 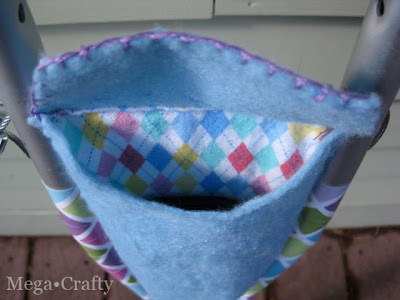 This time thought I decided to forgo using the machine and opted to sew my handy dandy pocket by hand. I'm actually really happy with how it came out. It holds a few essentials and seriously makes the crutches about a thousand times better. My knee is getting better- in fact I only need the crutches some of the time now. If I've iced and rested my knee I can do a bit of limping around without them. And tomorrow I have my first PT appointment so soon I think I'll be back to my regularly planned March crafting. What a great idea! 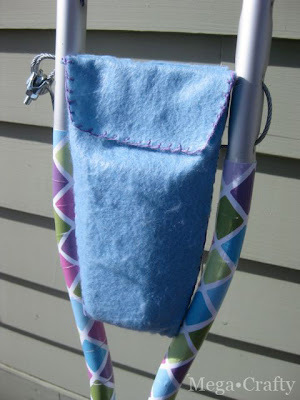 I could have used some thing like this when I was on crutches - going to put this on a future project list to make and keep on hand to give to whoever I know that ends up on crutches. Thanks for sharing this with us! You should get a patent on this and sell it, or maybe make them for charity when the need arises. I love the idea! Thank you Lisbonlioness! 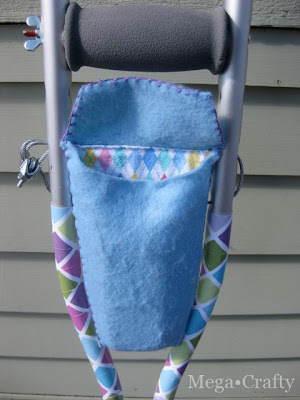 I'd love to make them for people on crutches... especially kids. 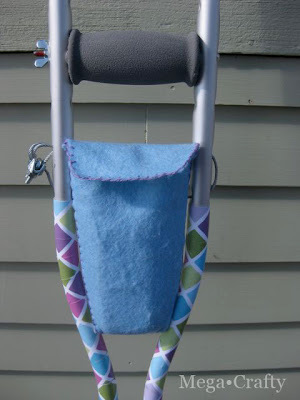 I LOOOOOOOOOOVE that you decorated the crutches and came up with a way to carry things! I love this blog. Just found it, and loving it! I sometimes haveto use a cane and it looks SOOO old and black and I'm too young for that "look" so I am going to try and decorate my cane! Did u haveto sand the slick metal on the crutches in order for it to stick? Hi Michele, Thanks so much for leaving a comment and for the nice things you said about my blog- very sweet. I didn't have to do anything to the aluminum on my crutches before I podged them. Just found a paper I liked and had at it. But if your cane has a glossy finish you might have to give it a light sand/scuff before you start. Here are 5 tips I have from my experience with this project. 1. test a small inconspicuous area before you try to cover the entire thing. 2. Put the podge on the metal in a thin coat- then wrap paper around tight and apply pressure to keep it smooth. 3 Let it dry completely before going over the top of the paper with podge. 4. work in small areas- if your using 12 x12 scrapbook paper work in one 12 inch tall by however much it takes to wrap around the cane section at a time. And last but not least 5. Use the hard coat formula of mod podge. It will be the most durable. I'd love to see a picture of your project once you are done!! !